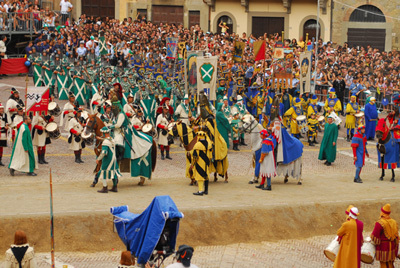 The Giostra del Saracino or simply “Il Saracino” as it is known among the aretini (inhabitants of Arezzo), is the event that represents at its most the traditions and the history of Arezzo. The Saracen Joust is a historical event with very antique origins: 13th Century documents show how Aretins were fond of jousts and tournaments and the joust was certainly carried out in 1400. The most ancient document, however, is a Priors’ resolution stating that the Joust against the Saracen should take place on Sunday and that the prize would be a piece of purple satin. There is no doubt that the Joust originated from the Crusades and the raids of the Saracens which reached Arezzo as well as other parts of Italy. The oldest regulation we know of is dated 1677. 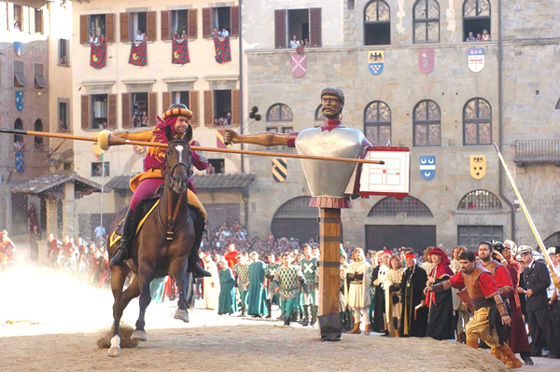 The rules in this valuable document are partly different from the modern ones: particularly, at the time any armed knight who showed up in the main square (Piazza Grande) accompanied by his godfathers, could join the joust; today the town is divided in four quarters and each one of them competes for the Lancia d’Oro, the prize for the winner. 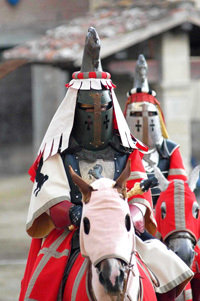 The Joust of the Saracen was re-established on 1931 after a long period of inactivity. Today the Joust is traditionally held each year on the Saturday before the last in June (in the evening) and the first Sunday of September (in the afternoon). The participants, who are dressed in costumes of the period, are altogether about 250 and include soldiers, musicians, valets, flag jugglers, knights, jousters and infantryman of the council. On the Sunday before the Joust the quarter captains take an oath in the town-hall square and the race order is drawn up: it is a solemn ceremony that takes place in a very picturesque setting. On the day of the Joust the historical procession marches on parade through the ancient and most beautiful streets of Arezzo, before entering Piazza Grande - one of the most characteristic and ancient squares in Italy - where the tournament takes place. 3. The horseman who brakes his lance while striking the Saracen’s shield gets double score. A ceremony with the offering of the candles to Beato Gregorio X. During a solemn ceremony, whit takes place in the town hall, prizes are awarded to the jousters, both veterans and beginners, who participated in the previous joust. During this ceremony, the tables with the marked scores, which were kept private until then, are exposed to the public for the first time. Every year an international competition is announced for the designing of the grip of the “Golden Lances”, that are the trophies for the Saracen Joust. Among the designs sent by artists from all over the world, the jury picks the winning sketch, from which a skilled craftsman will carve the new Golden Lance. All the selected designs are exposed in the old palace. In the Sunday morning before the Joust (on the Friday for the June edition) the captains of the quarters take and oath in the town hall square and the race order is drawn up: it is a solemn ceremony which takes place in a very picturesque setting. In the days just before the Joust the horsemen of town quarters train themselves with the horses in order to prepare the big final. Among the shouts of the crowd they run against the “Buratto”. 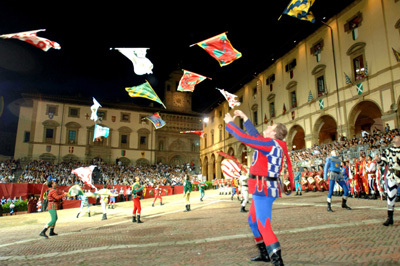 In the evening of Thursday for the June edition and on Friday for the September edition, in the splendidly illuminated Piazza Grande a general test of the tournament is carried out with the entrance and alignment of all the armed men, the other participants, the musicians and the horsemen. With a great popular participation the young “reserve knights” dare the Buratto, the “King of the Indies”: a true anticipation of the show that is about to go on. In the morning, in Piazza San Francesco, according to a precise and ancient ceremonial, there is the official investiture of the knights and the stamping of the hoses that will run the Joust. In the evening, in the squares of the four quarters, take place the propitiatory dinner and they represent opportunities for a genuine popular participation to the life of the quarter itself. In the morning the historical procession follows the Herald who reads the announcement to all the people. In the afternoon there is a suggestive procession with more than 250 participants, between two wings of crowd along the town roads, among flag waving and rolling of drums. In Piazza Grande, after the performance of the flag jugglers and of the musicians and after the reading of the challenge to Buratto, the King of the Indies, the exciting Joust begins. Two horsemen from each quarter charge against the huge effigy of the Saracen according to the draw and, by striking its shield with their lances, try to get the best score. Once the Saracen is hit by the lance it starts rotating and threatens the horseman with a heavy whip armed with lead and leather balls. The quarter obtaining the highest score wins the “Golden Lance”. When: Every year on the Saturday before the last in June (notturna, the evening one) and on the first Sunday of September (pomeridiana, afternoon). Minor celebrations and ceremonies throughout the year. By train: Most trains going from Florence to Rome will stop at Arezzo. Piazza Grande and the town centre is just 10 minutes walk from the station. By car: Once arrived in town follow signs for the “Petri” car park. The escalator leads in front of the duomo in the highest part of the town centre; just continue down to Piazza Grande.